Because he was a pathetic, cowardly, impotent-minded chicken who planted bombs to kill innocent people…but didn’t want to get hurt himself. And so it happens again. What can only be described as a Terrorist attack on our soil and our people has once again shocked, saddened, and quite frankly sickened us all. It took just seconds for innocents - including an eight-year-old little boy - to lose their lives and at least 150 others suffer injuries - many grave. But in the Spirit of our Country, it took just seconds more for Police, EMT’s, Medical Personal and bystanders with no training but a deep sense of humanity, to spring into action and do everything they could to help the injured - and control, calm and direct the massive crowd away from the scene to prevent further loss of life. There is certainly nothing coincidental about the fact that this despicable act was carried out during one of our country’s longest traditions - the Boston Marathon, on a day that the city that played such a defining role in the formation of our great nation celebrates as “Patriot’s Day”. Perhaps the perpetrator doesn’t know what a “Patriot” is. We are a people whose Forebearers stood up against incredible odds to break free of tyranny more than two centuries ago. Those men and women - many in the city of Boston - risked their lives to create a new world - where they, and the generations to follow, could live in a land of Freedom. And I believe those remarkable and brave visionaries passed on more to us than just a love of Liberty. They passed down a deep, unshakable love for Our Country. We are called the UNITED States of America for a reason: We always stand United… and we will never “stand down”. We will find you and bring you to justice. What we will not do is cower in fear or change the way we live our lives. Today, we send our thoughts, love and prayers to the victims and families of those impacted by this tragedy. But also today, and for every day to come, we will - each of us - fight back against those who would do us harm. 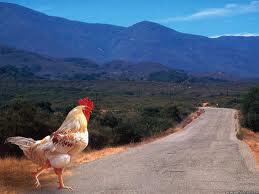 So no matter where you go, Chicken…We’ll be waiting for you on the other side of the road.